Four is a reasonable age to begin violin lessons. Based on several well-known women violinists born around the same time as Jessica Hindman — Rachel Barton, Leila Josefowicz, Hilary Hahn, Julia Fischer — the best age to begin seems to be three, but Lisa Batiashvili and Sarah Chang were four when they started, and Janine Jansen was six. But it was not to be. Where young Jessica was growing up in West Virginia, violin lessons required a long drive, and Jessica didn’t begin until she was eight, and even then, she had only a half-hour lesson a week. Still, this is America, and one of the most compelling lies we tell ourselves is that with some hard work, you can do anything you set your mind to. Young Jessica has a big incentive to work hard at the violin, for one of the alternatives is the chicken plant. One girl your age, who lives a few miles up the road from your grandparents’ house, will witness “chicken-stomping” at this very plant, a practice that disgusts her so much she decides to quit her job there and join the army, figuring that the army can’t be any worse than chicken-stomping. Her name is Lynndie England. But then, amazingly, she gets a job as a professional violinist, and she doesn’t even have to audition. What’s most important is that the job help pays for college. Hindman gets a job with The Composer, a man whose music is wildly popular among a certain class of undiscriminating listener. The Composer had released dozens of CDs of his music, and Hindman’s job is to be part of a small ensemble that plays this music at crafts fairs and shopping malls and the QVC channel — sometimes for eight hours at a stretch — to sell these CDs. But here’s the catch: She’s not really playing the music. The music that the customers hear during these marketing fests comes from a prerecorded CD. She’s faking it, but she must learn the scores anyway because she must play along authentically. All that violin training is paying off because she can move her fingers on the fingerboard and maneuver the bow with great authority, but not actually make any music. “Milli Violini” she calls it. 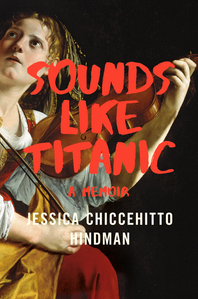 The Composer’s music makes extensive use of penny whistle, and some melodies are eerily reminiscent of the soundtrack from a famous movie, so many people remark that the music “Sounds like Titanic.” Hence the book’s title. The Composer’s fan base consists of devoted listeners who love his calm and soothing music, and who often find it therapeutic while suffering with serious illnesses, or worrying about their children who have gone off to fight wars in Iraq and Afghanistan. The testimonials are true and heartfelt. Although Hindman refers to the man behind the music solely as The Composer, and she disguises the names of his CDs, he has been identified as Tim Janis, and the God Bless America PBS special described in the book is actually the Beautiful America PBS special, in which you can experience almost an hour of Tim Janis’s insipid drivel not actually being played by the musicians on the stage. Hindman even discovers how the sausage is made when The Composer gives her and another violinist an MP3 of a piece he’s just composed on keyboard, and asks them to write out the violin parts. It slowly dawns on her that The Composer “has no idea how to write a violin part,” and that she and the other violinist are effectively orchestrating the music — a job that is usually performed by real composers themselves or relegated to professional arrangers. There is much more in this witty, insightful, and ultimately moving memoir than life on the road with a fake musical ensemble. Two of the sections I enjoyed a lot involve Lindman’s job with MTV (pages 189 to 195) doing early research for a program that will become the Teen Mom series with a result that is as shocking as it is inevitable, and her description of her final high school solo violin performance (pages 215 to 220). Coming late in the book, these stories help propel the book to a very satisfying conclusion — ultimately about finding one’s niche in life, despite there always being a little fakery involved.